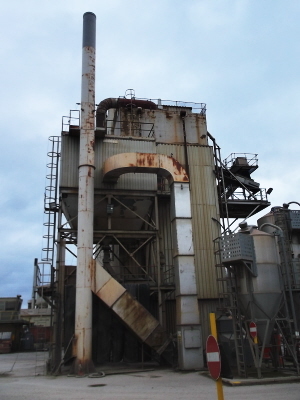 An Asphalt plant in the north west of England is predicted to reduce the cost of replacing burnt out motors and improve its plant uptime by fitting inverters to a coater drum motor and a burner fan motor. The coater, which is the second stage in the asphalt producing process, is used to coat heated aggregate with asphalt. The coater is driven by an electric motor and is prone to blocking which results in a large build-up of current causing the motor to burn out. When this happens, the motor needs to be replaced, which can take around a day to complete, resulting in lost production at the plant. Following a free energy survey of the plant Inverter Drive Systems, Technical Account Manager, Leon Ball, specified an ACS580 inverter to be fitted to the motor. Using the torque control settings in the inverter, it was set to stop the motor should a jam occur and thereby prevent the motor from burning out. It is estimated, for each instance, that this will save approx. £30,000 in motor and lost production costs. They currently have an average of two motors lost to burn out each year which will mean a saving of £60k per annum. An additional benefit of using an inverter in this fashion is the reduction in energy usage resulting in a cost saving of approximately £3,736 per annum. The burner fan was previously temperature controlled via a mechanical damper with two settings. Fitting an ABB inverter using PID temperature control allows the fan to run at correct speed according to temperature requirements, with finer control. The result is a reduction in energy usage and a conservative cost saving estimate of £3,000 per annum. This Asphalt Plant stands to save in total £66,736 every year (more if energy prices continue to rise) which is the total cost of the 2x motors they were going through each year, the 2x days production lost and the continuous energy savings available. As we publish, this project is undergoing the CAPEX process.